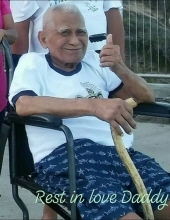 Celebrating the life of Bonifacio Gabaylo Sr.
Obituary for Bonifacio Gabaylo Sr.
Bonifacio 'Pacio' was born June 4th, 1934 to Bernaldo and Alipia Gabaylo. Pacio was raise in Ewa, Hawaii. Pacio was a painter by trade. He loved fishing, crabbing, cruising around the island, made fishing nets, carving sculptures, wood works and made toys for the kids. He loved to crack jokes to make the kids laugh. On Tuesday July 3rd, 2018, Bonifacio passed away. Same day services will be on Saturday September 15th, 2018 at Nuuanu Memorial Park Mortuary at 10am to 11am for viewing. Immediate burial to follow at 12pm to 12:30pm at the Valley of the Temple. To send flowers or a remembrance gift to the family of Bonifacio Gabaylo Sr., please visit our Tribute Store. "Email Address" would like to share the life celebration of Bonifacio Gabaylo Sr.. Click on the "link" to go to share a favorite memory or leave a condolence message for the family.